Chennai, January 25: “You know, there is a Perumal temple in southern Tamil Nadu, which has a painted image of a ship, and the legendary Kunjali is worshipped,” informed a friend of mine, aware of my interest in the maritime heritage of the Tamils. The Maraikkayars were seafarers from the Tamil country, and among them, the Kunjalis of the 16th century were renowned for their heroic naval battles with the Portuguese. Though many volumes have been written and films made on them, the Kunjalis being immortalised at a temple was news to me. So on a balmy afternoon, I landed at Madhavan Kurichi, a small village adjacent to Manapaad, off the Coromandel Coast, in Thoothukkudi district. At the village square, my enquiries about the Perumal temple elicited no response. As I was losing hope, a garrulous woman who had just arrived on the scene, led me to her family temple. When she pushed open the gate, there it was, a painted image of a ship of yore with masts and sails, right on top of a mantapam. Inside, amidst an array of fearsome-looking folk deities was a lone painted image of a bearded Kunjali Maraikkayar, attired in a white checked lungi, a green shirt, and a white Turkish Fez cap. It was a little over five hundred years ago that Vasco da Gama found a sea route to India, landing at Calicut. The Portuguese, with their superior fire power and navigational expertise, went about monopolising the lucrative maritime spice trade on the Indian Ocean. They mandated that any ship traversing the ocean should have a Cartaz, a pass issued by them. Even if one paid and got the Cartaz, Indian ships were prohibited from carrying profitable goods. Soon, Indian ships sailing in Indian waters without a Cartaz were confiscated by the Portuguese. The audacity of the Portuguese was resisted by the Zamorin (Samuthri), the ruler of Calicut. To counter them, the Zamorin fielded his naval admirals, the Kunjali Maraikkayars. The Kunjalis, who were originally from Cochin, stood by the Zamorin and fought the Portuguese on the Kerala and Coromandel coasts. Calicut, Ponnani, Kollam, Kochi, Kayalpattinam, Thoothukudi, Kizhakkarai and Vedalai were some of the places where battles were fought, both on land and at sea. The Kunjalis knew that their ships were no match for the big Portuguese vessels (Caravels) which were fixed with heavy guns. However, while Caravels needed room for manoeuvre and required a high wind velocity for faster navigation, the smaller craft called ‘War Parades’ used by the Kunjalis could be rowed through lagoons and narrow water channels, and did not easily present themselves as easy targets to the Portuguese guns. Madhavan Kurichi is one of those places, where the channel gets narrower as the river opens into the sea at nearby Manappad, a Portuguese stronghold in the 16th century. Though the Kunjalis fought with valour and won some of the battles, in the end, the superior fire power of the Portuguese and disunity among the Indian states led to their downfall. One wonders if it was near Madhavan Kurichi that one of the Kunjalis or his deputies met a tragic and violent end, fit enough to be accorded the status of a folk deity. As the Maraikkayar got deified, the stories associated with him also grew. Listening to the locals, one could hear the narration differ from person to person, sometimes even at variance with the Villupaattu (a ballad performed with bow and string instrument) performed during the annual temple festival, which we attended later. Despite this, the similarities with the actual history and casual reference to forgotten aspects of our maritime traditions were indeed fascinating. “Our Maraikkayar had 999 ships and he desired that his thousandth ship should be built without any nails… So he went into the forest with his men, in search of a tree, big enough to make his ship,” booms the voice of Serma Sundari Damodaran as she narrates the tragedy of the Kunjalis in her Villupaattu, sitting along with her co-performers in a small stage like enclosure, opposite to the painted image of Kunjali Maraikkayar. 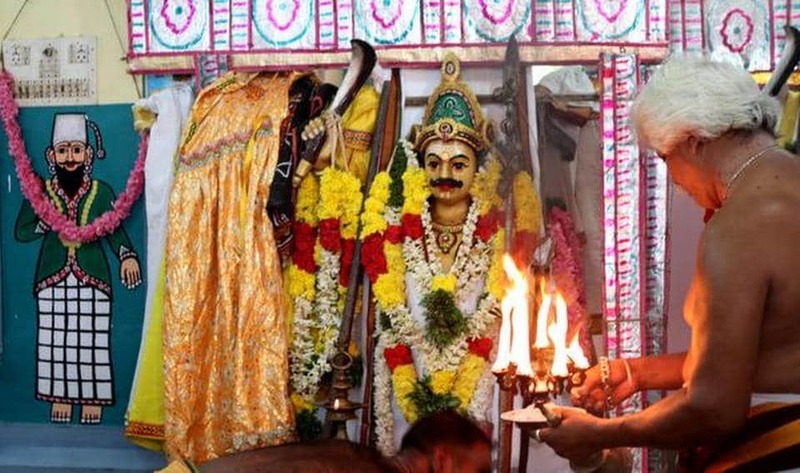 Every year, during the Tamil month of Purattasi, Serma Sundari and her troupe narrate the story of the Kunjalis, the ill-omen that began with their cutting of the big tree where one of the Gods resided, their tragic end in the sea battle, and how the Maraikkayar ended up as one among the Gods at the temple. The similarities that we find in the narration at Madhavan Kurichi with that of the actual historic account of Kunjali Maraikkayars are too many to ignore. Everyone at Madhavan Kurichi acknowledges that the tragedy did in fact take place some 400 to 500 years ago, thereby placing it in the 16th century. The account speaks of the Kunjalis as two brothers — Kunnali and Kutti Ali Maraikkayar — names that tally with the different Kunjalis of the Zamorin. The legend at Madhvan Kurichi begins with the Kunjalis’ desire to build their thousandth ship without nails. Interestingly, before the advent of the Europeans, Indian ships were built without nails, a technique that has been almost forgotten. The Villupaattu also refers to the battle-hardened troops aboard the Kunjalis’ ship, who join the sea battle during their trip from the Kerala coast that ends in defeat. But Serma Sundari’s narrative places the Kunjalis as rulers of nearby Kizhakkarai, and the battle as one between an angry God and the Kunjalis. Considering the fact that the incident happened some 400 years ago, and the present inhabitants, the Servais, moved into the village a little later, there are bound to be gaps in the narration. “Did the original inhabitants, perhaps as allies of the Kunjalis, feel compelled to vacate the village after the tragedy?” “It is quite possible,” concedes A.T. Karuppasamy, Samiyadi at the Perumal temple. Is this Kunjali from the same clan as the legendary naval admirals who fought against Portuguese colonialism, whom the Indian Navy has honored by commissioning the INS Kunjali in 1954? There are simply too many similarities to ignore. Is the desire to build the thousandth ship without nails, a metaphor, a longing to resurrect the good old days of maritime trade when Indians benefited from it? Whichever way one looks at it, the tragedy of the Kunjali Maraikkayars was also the tragedy of Tamil maritime trade. With the death of the Kunjalis, a maritime trade that brought riches to the Tamil country would fall into a steady decline, and ultimately, into oblivion. It is heartening that hundreds of years later, Madhavan Kurichi, a small village in southern Tamil Nadu, still commemorates these seafarers of yore. Kombai S Anwar is a historian, writer and filmmaker based in Tamil Nadu.